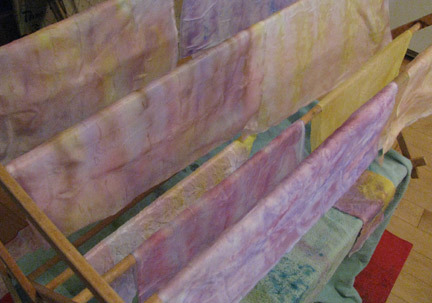 It's great when you can have the luxury of spending several uninterrupted hours painting silk and drying it in the sun! It's especially a luxury in New England, when an unexpected warm and sunny fall afternoon showed up! 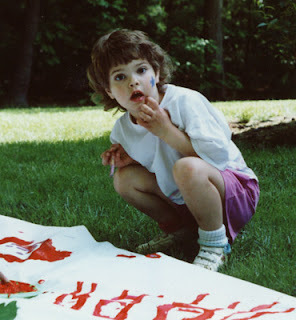 I know exactly what I'm going to do with these painted silk pieces...make a companion piece for the quilt I just completed, As Daylight Fades, which will be called At First Light. 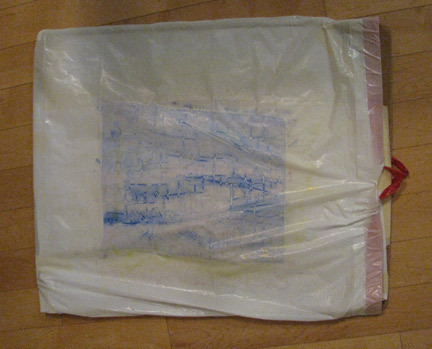 I used a couple of large smooth boards that I cover in a kitchen-sized plastic bags as a work surface. This allows me to transport them outside easily for drying in the sun. I'll show you some close-ups of the best results next week, along with some tips on how to get the look! Cyndi... where do you find your silk? I'm sure you've probably already told us that, but I seem to have missed it. Thanks! I may or may not have remembered to say! I had quite a stockpile that I had been able to buy at a local fabric store that wasn't a chain, but that's long gone. Recently I placed an order with Dharma Trading, and was very pleased with the quality. There are other places you can get it online as well. It seems that many JoAnn's don't bother to carry much silk. I get my silk from Dharma Trading as well. 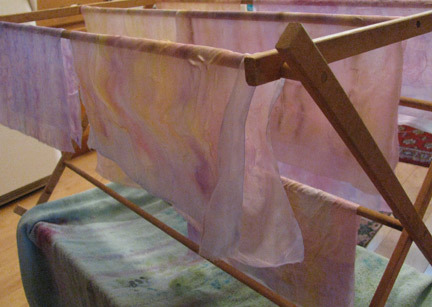 These silks are so pretty!